Set up the microscope in scanning mode and in the appropriate state for the spectrometer you wish to use. Refer to your microscope manufacturer's user manual for details. 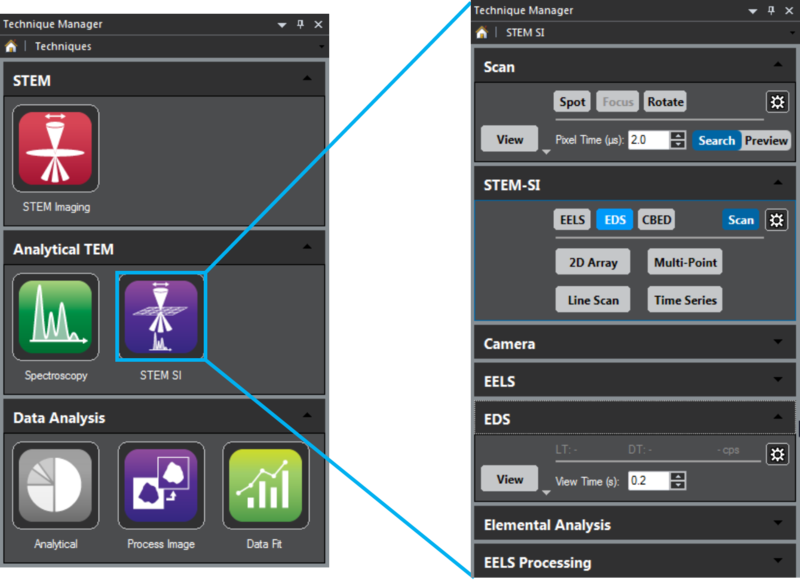 When you configure your system for STEM spectrum imaging (SI) acquisition, you can control your STEM SI easily when you use Gatan Microscopy Suite® (GMS) software. 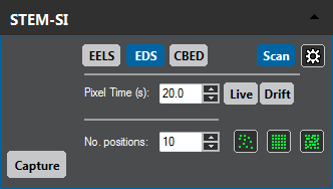 Note: All signal acquisition palettes hide their respective Capture functionality by default. You can expand the palettes using the plus icon to the right of the View button. Setup and control of the SI acquisition is provided via the STEM SI palette. On the initial display, or if no STEM SI experiment is currently set up, the palette will be displayed in mode selection state. Brief descriptions of the dialog features are given below. 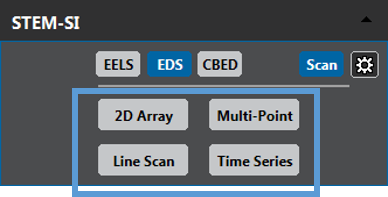 The top section of the palette features a button for each available signal in the STEM SI experiment (EELS, EDS, CBED, and CL). 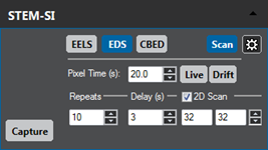 The according signal acquisition palette will be automatically expanded or collapsed which may trigger requests to change the microscope state if required. At least one signal (in addition to the Scan button) needs to be selected or the SI experiment cannot be started. Note: Some signals are mutually exclusive. Selecting such a signal will automatically deselect the other. Use the bottom section of the palette to set up spatial coordinates of the SI. Pressing a mode button (2D Array, Line Scan, Multi-Point, and Time Series) will automatically assign a suitable survey image and create a default SI survey ROI marker on it. If no suitable image is available, a Preview type acquisition is automatically started and assigned. Note: The acquisition time estimate is automatically updated when the dwell time is changed. The size automatically updates if you change the SI survey ROI position on the active survey image. When you change the Width value, it will automatically adjust the sampling resolution while keeping the acquired region the same. A change in height will change the aspect ratio and hence the acquired region of the SI, while keeping the sampling resolution identical. Note: The acquisition time estimate automatically updates when the size is changed. 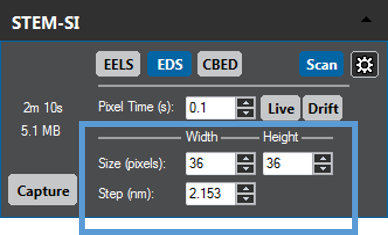 The sampling resolution automatically updates when the size is changed. 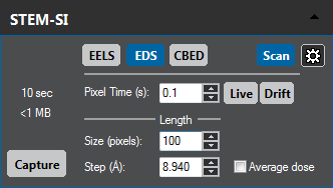 Step displays the current sampling resolution in calibrated units. The SI size in pixels updates automatically when the sampling resolution is changed, keeping the acquired scan length identical. The number of survey region of interest (ROI) point markers is undated accordingly. Note: At least 2 points have to be specified before SI acquisition can start. Note: At least 2 repeats have to be specified before SI acquisition will start. During these pauses, signal controllers are stopped and the beam control is released to the default. The acquisition is then in idle state similar to a paused acquisition, but a countdown is displayed at the bottom of the STEM SI palette. At the end of the countdown acquisition, the next spectrum is automatically started. If checked, spectra is acquired while a specified area is rapidly and repeatedly scanned. The area is represented by a ROI rectangle in the survey image and sampling for this area is defined by the two fields below the check box. Enter values to change the area size or use the up and down arrows to change the sampling density of the area.